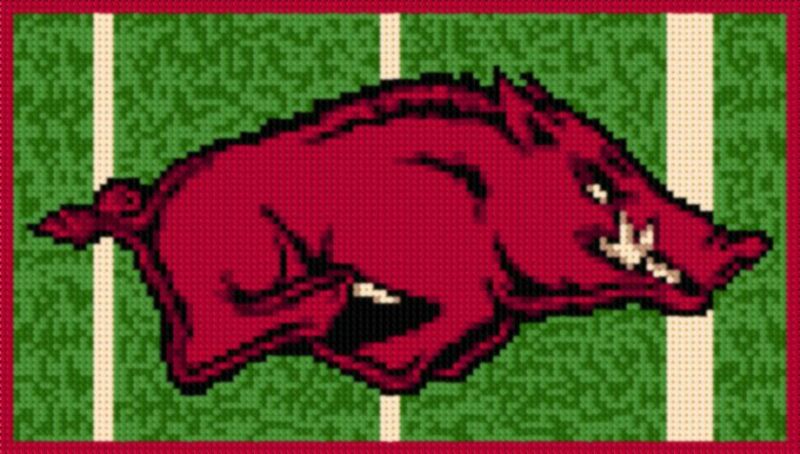 Latch Hook Rug Pattern Chart: ARKANSAS RAZORBACK A computer generated latch hook rug pattern (NOT A KIT) Dimensions: 120 holes X 69 holes With 3.3 mesh, finished size approximately 36” x 21” With 3.75 mesh, finished size approximately 32" x 18" With 5 mesh, finished size approximately 24" x 14" This package consists of a simulation of what the finished project should look like, a color pattern chart with symbols, a color key using Anchor/Readicut/Shillcraft colors (although any yarns could be used), notes giving suggested canvas size, etc., and a black/white pattern chart with symbols. These are packaged into .pdf files which can be opened using the Adobe Reader. The Adobe Reader can be downloaded for FREE from this website: http://www.adobe.com/products/acrobat/readstep2.html The package will be emailed to you when payment is received. That Means: NO SHIPPING CHARGES!!! IMMEDIATE DELIVERY!!! This sale is for a pattern/chart only to be sent via email - not a kit - no canvas, no yarn!